What is the best way to manage junk food in general with kids? It is important to help your kids learn skills to eat healthy foods and also to balance junk foods chosen more for celebration, taste, and non-nutrition reasons. If you raise your kids in a home free from all junk foods, don’t be surprised when they over-consume these forbidden foods at a friend’s house. At the same time, your kids don’t need several treats in their lunch each day, candy after school, and dessert after supper every day, or they will be missing out on key nutrition needed for growth, health, and learning. How should we manage candy on Halloween night? Keep in mind that what happens one day out of the year won’t matter. It is what you do between Halloween this year and next year that is most relevant. There are no bad foods, just bad overall diets. Make sure your kids are fueled with one of their favorite healthy supper meals that will fill them up with sustained energy for trick or treating. Go for a make-ahead slow cooker chili with rice and steamed veggies, homemade pizza and salad or pasta and meat sauce with salad. Let them know there will be opportunity to enjoy candy when they get home. When your kids get home, have fun with them. Encourage them to dump out the stash and celebrate their awesome collection. Get them to pick the top three to five favorites and ask if they will share something with you. Observe how much they consume without making any comments or providing them with any rules since you might be surprised how many kids self-moderate and eat only a few pieces. If you notice your child has inhaled about half a dozen of their favorites, ask them to pick one more of their top choices and remind them that the stash will be there tomorrow to enjoy again. What are some options on how to deal with the large pillow sack full of candy after Halloween? “Stash for Cash” – offer the choice to keep the candy stash or alternatively trade some or all of the stash for cash. “Switch Witch” – ask younger kids if they would like you to call the “Switch Witch” who is similar to the tooth fairy but switches some or all candy for toys. 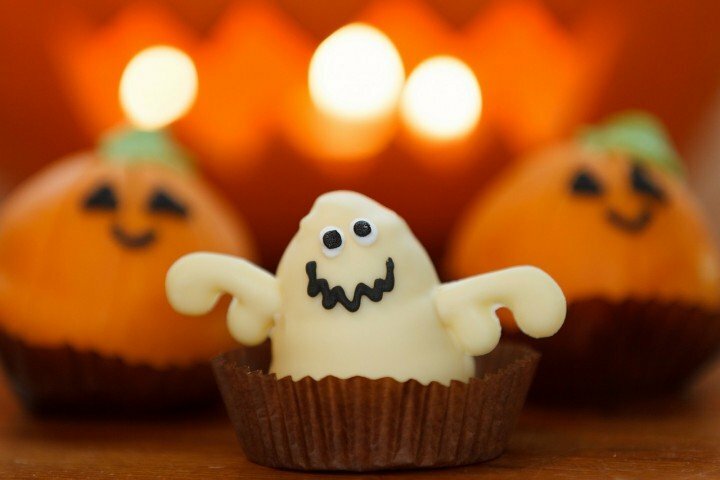 What are some healthy Halloween foods you can make with kids? Stir up a “witches brew”. Add fresh or frozen blueberries into oatmeal while cooking to make “purple porridge”. Use a meatball/melon baller to scoop out honeydew melon pieces to make “green eyeballs” to add to the top. 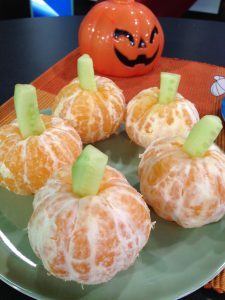 Peel mandarin oranges and place a small cut piece of celery or peeled cucumber in the middle to look like a pumpkin. Make “witches fingers” by buying small farmers market fresh carrots and placing a bit of nut butter on the end to stick on a flat sliced almond. Peel and cut bananas in half and place on Popsicle sticks if desired. Push in raisins to make eyes and a mouth to look like ghosts.